Fishing in the Pacific Northwest is one of the best ways to enjoy the water here. From river fish like salmon and trout to large deep-sea halibut to shellfish, the abundance and variety of opportunities here feels boundless. 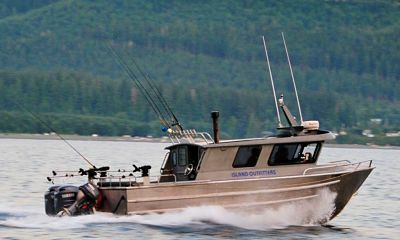 There are chances to drop a line right downtown in some areas, as well as dozens of designated fishing resorts minutes to hours away throughout this portion of BC. Even if you do not catch a thing, the restaurants here feature local seafood proudly, so at least you know you will be able to eat like you caught just what you were looking for. For those who are unaware, there are actually three different main styles of kayak, and all of them can be used in and around Vancouver. The rivers tumbling down from the Cascade Mountains are great for experienced kayakers to flip and play with whitewater boats. 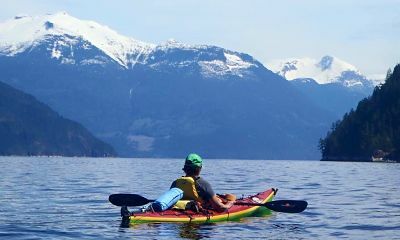 Lake and sit-on-top kayaks can be used in the calm harbors surrounding Vancouver, and opportunities to rent them by the hour here abound. The most commonly used boat type here is the sea kayak, and the inland seas here abound with opportunities to take sea kayak tours that range from a few hours to multi-day trips. There are lots of choices on how to use a sea kayak, like whale watching or even learning how to fish the shallow, narrow regions of the area . Though they are not fast, there are lots of campgrounds on the uninhabited shorelines and island of BC that cater to kayaks, and can only be reached by small boat. The most daring boaters of all might even consider the international kayak trail that reaches from southeast Alaska all the way down to Olympia, Washington, and stays on inland seas almost the entire way. This quiet, slow method of boating is one of the best ways to see wildlife, and curious animals like harbor seals enjoy coming right up to you for a closer look. If a trip to Alaska from here sounds fun, but you want the voyage without the work, Vancouver is one of the largest cruise ship departure ports in the world. Though most of these ships are heading north to Alaska, there are also a number that wind their way down the west coast to Mexico instead. Cruises here can be in either large boats or small, and many of them will have themes. Smaller boats may give options for whale watching or fishing day-trips while the boat is in port. Larger boats may visit nearby must-see locations like Victoria, and may offer a chance to see the secluded and rarely viewed coast of outer Vancouver Island. Highlights include all-you-can-eat food, many entertainment opportunities, and a chance to see orcas, grizzlies, and humpbacks in the wild, as well as a chance to explore both British Columbia and southeast Alaska. Cruises give a great opportunity to visit different areas with someone else as a captain, but then rent a boat for local day trips at different ports. 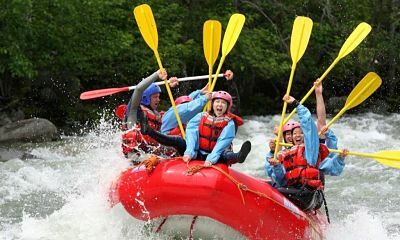 If you love adventure, there are few things that offer the exhilaration that whitewater rafting can give you. The rivers here will not disappoint you. One important note, this is not warm water — the source of the rivers is snow and glacier melt, and you will definitely feel it. If you work with a guide company, they will make sure you are safe and appropriately dressed. 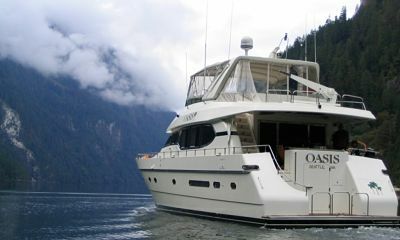 There are so many great places to explore by boat in and around Vancouver that many people will want to do multi-day boating trips here. The different kinds of boating trips here are almost infinite. 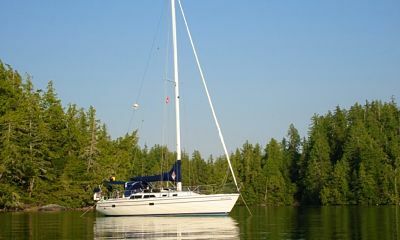 There are great opportunities to go by sailboat or powerboat, large boat or small. You can stay at marinas, boat-in resorts, on mooring buoys or at anchor. There are places to hike and camp that are available exclusively by boat, particularly around the island chains inside of Vancouver Island. Trips can be for a single night, or you can take a month-long voyage up the Inside Passage and discover the joys of a long sea journey. Food can be found by making one-pot meals at sea, at boat-in restaurants, by beachcombing for clams and oysters and gathering wild kelp and blackberries, or dropping a line for a fat salmon or cod. Vancouver is a great place to take a whale watching trip. 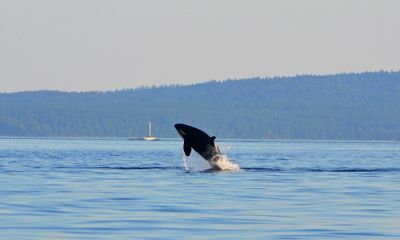 The Strait of Georgia shares the world’s most famous orca population with Washington state, and summer whale watchers here have the opportunity to be treated to the acrobatics of around 85 charismatic killer whales. This is just a part of the whale population here, however. Minke whales are subtler and in the Strait of Georgia in abundance, but the appearance of their 35’ long bodies is still exciting. Other sightings like humpbacks, white sided dolphins, and gray whales are less common but definitely possible. The most exciting thing about whale watching from Vancouver is the way in which many tour companies choose to go see the whales. 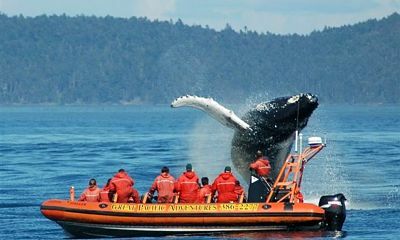 The most common whale watching boat here is a hard-sided inflatable raft that is capable of high speeds and gives lots of exposure for guests to observe the wildlife. The coverall Mustang Suits are well worth the experience, however, as whale watchers are right at water level, and get some of the closest and most dynamic whale views of anyone on the water. The city of Vancouver was named for General George Vancouver, whose journals introduced the Pacific Northwest waterways and local tribes to the rest of the world. Boating here offers a chance to recreate this journey and to see how much of it has changed, as well as how much has remained the same. Civil War buffs can also enjoy a short journey southward to see the most surprising battleground of the whole civil war. San Juan Island in Washington has Civil War soldier camps from both the British, who were hoping to reclaim more colony land during the war, and the Americans. One battle was fought here over an unauthorized shooting of a pig. There are a number of local tribes who have villages and celebrations along the waterways of the Pacific Northwest. They are called tribes in the United States and First Nations in Canada, though either place you visit will offer a chance to see the culture, art, and lifestyle of people who have been here for ten thousand years. One especially great time to visit is in July and August during the canoe journeys, as it gives you the chance to spend time on the water near hundreds of traditional dugout canoes from three states as well as Hawaii and New Zealand as they make their journey to the shifting annual host city. Jacques Cousteau ranked the Pacific Northwest second only to the Great Barrier Reef as far as his favorite dive spots. Large, colorful rockfish, enormous halibut, and harmless six-gilled sharks, as well as the world’s largest species of octopus are just some of the joys to encounter here. The rocky outcroppings are filled with rainbows of anemones, tubeworms, and nudibranchs or sea slugs. The water is clear and Caribbean turquoise, with long-range visibility. It is also cold, however, and most people prefer to dive with a dry suit. 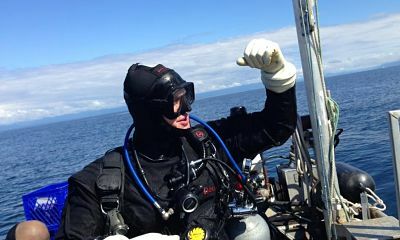 There are lots of dive outfitters in Vancouver who can take you on day trips, but you can also dive with your own boat, and get tips on the best spots for the current weather and tides from local dive outfitters. Though many people do not consider driving and boating to be a combination, the excellent ferry system that BC has to offer gives a lot of opportunities to do just that. Vancouver offers several points of entry to Vancouver Island, as well as a few northern routes that allow you to do a loop if you prefer. This is the best way to get a car to Victoria and they are a great way to get to port towns like Nanaimo to start a fishing or boating trip from there. No matter how you choose to get on the water in Vancouver, you will not be disappointed. The temperate weather makes it great year-round, provided you bring layers and water and wind protection. The friendly people, beautiful scenery, and diverse culture make this a fabulous city to visit on land. To spend time on the water here, however, makes it one of the most extraordinary locations on earth.